Eloise Secker is an actress and theatre maker from Norfolk based in London. She trained on the prestigious Actor Musicianship course at Rose Bruford College, graduating with a first class honours degree and was a finalist for the BBC Carlton Hobbs Competition. She has regularly worked for BBC Radio 4 and was a regular on the BBC Radio 7 series Chain Gang. She is an experienced audio book actress working for Harper Collins and Audible and has provided the voice for global companies such as Tesco and V.Group amongst others. 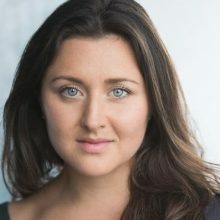 She has worked extensively for the Royal Shakespeare Company, most recently performing in the West End transfer of IMPERIUM at the Gielgud Theatre. Eloise is also a choir leader and runs sessions for Some Voices, London’s largest contemporary choir.